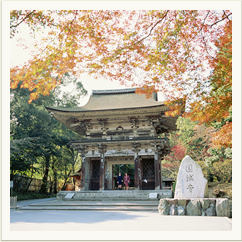 "Benkei no hiki zuri gane"
The Onjo-ji Temple, as head temple of the Tendaijimon Buddhist sect, has long been considered as one of the Four Great Temples of Japan. Throughout history, the emperors Tenji, Kobun and Tenmu modified its structure and name through various imperial orders. Prince Otomo Yota no O, son of emperor Kobun, first started the building process of this huge and expensive structure, followed by emperor Tenmu who named it Nagarayama Onjo-ji. 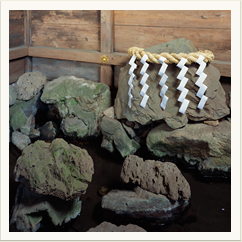 Its common name “Mii-dera” (“temple of the three wells”) comes from the miraculous spring in which the three emperors Tenji, Tenmu and Jito were given their firth bath (Ubuyu). Later, the great Buddhist teacher Chisho used this spring water to perform the Sanbu Kanjo ritual (Buddhist rite of passage during which the master figuratively “pours” his knowledge onto his student). 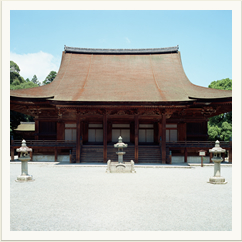 Despite the fact that, through its long history, the Mii-dera temple was repeatedly destroyed by fire, it has been restored each time thanks to the efforts of Hideyoshi Toyotomi and Ieyasu Tokugawa. 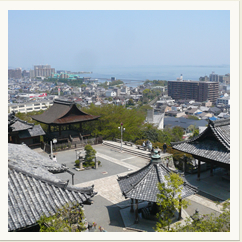 Today, it is designated as one of the national treasures (Koku-ho)and as an inportant cultural property (Juyo Bunkazai). 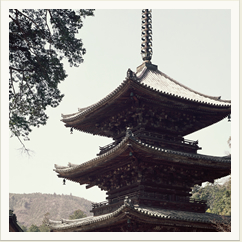 Along with its famous gardens, the Mii-dera temple is considered as a valuable heritage of Japan. 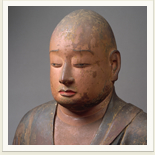 Chisho, named Enchin during his lifetime, was one of the founders of the Tendai Buddhist sect. He was born in 814 in Sanuki province (modern Kagawa prefecture). His mother was the niece of Kukai. He became the first head of the current temple in 859, and 10 years later the fifth head of the Tendai sect, and so during 24 years, devoting his life to the development of Buddhism in Japan. He passed away on October 29, 891 at the age of 78 years old. Emperor Daigo gave him his posthumous name of “Chisho”. 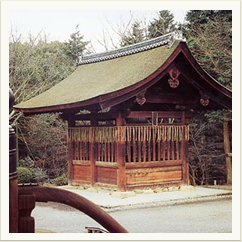 The temple bell, which was manufactured during the Nara period, is said to have been donated to the Mii-dera temple as an expression of gratitude to Fujiwara no Hidesato for the Extermination of the Centipede (“Mukade Taiji”, a legendary episode) living on mount Mikamiyama. 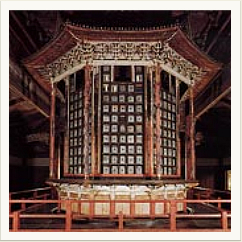 The bell is also said to have been brought back from Ryu-gu, the underwater Palace of the Dragon King. 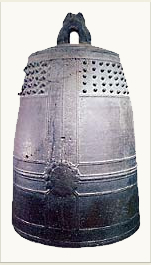 In the tenth century, during the succession disputes which broke out between Tendai monks, Benkei (a warrior monk, popular subject of Japanese folklore) took the bell away and dragged it up to the summit of mount Hiei. There, he tried to strike it and got mad when he heard it ringing “eeno eeno”, which means “I want to go back” in the Kansai dialect. 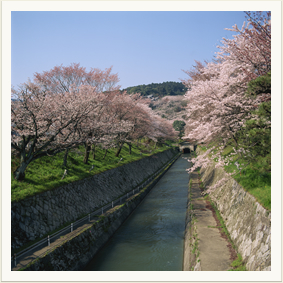 Benkei then threw the bell down to the bottom of the valley. The scars and cracks which can be seen on the bell are said to be traces of this episode. 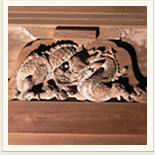 JA legend ingoro Hidari's dragon"
A famous dragon sculpture, which is said to be the work of Jingoro Hidari, can be seen on the facade of the Akaiya building, inside of which the miraculous spring that gave its name to the Mii-dera temple gushes out. The dragon used to escape and fly to lake Biwa night after night, causing damages. Worried, Jingoro himself drove spikes in the dragon's eyeballs to soothe the beast. Still today, the dragon is calmly watching over the Mii-dera temple from the facade of the Akaiya building.